HTC Desire Eye is the most capable member of the company's mid-range family of smartphones to date. Announced in early October, the smartphone features a rather peculiar camera setup, which consists of a duo of 13MP sensors, each flanked by a two-tone LED flash. HTC Desire Eye surely looks like a member of the Taiwanese manufacturer's mid-range lineup, though its hardware specifications tell an entirely different story. With a Qualcomm Snapdragon 801 SoC, 5.2" 1080p display, IPX7 certification, and BoomSound stereo speakers to go with the unique camera setup, the newcomer is as well-equipped as some of today's Android flagship devices. 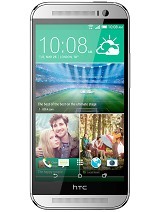 A quick glance at its key features reveals that the Desire Eye is actually better equipped than the still-standing company's flagship smartphone, the HTC One (M8). Only its plastic body prevents the handset from topping the company's Android family. The 13MP front-facing camera is a clear nod towards the rapidly growing, selfie-loving crowd - it makes the HTC Desire Eye stand out among its competitors. The 13MP unit on the back is a welcome sight too. We are all but certain that it will take better photos than the underwhelming UltraPixel unit of the One (M8). The relatively modest 2,400mAh battery seems to be the biggest question mark in the HTC Desire Eye. It is smaller in capacity than the unit found in HTC One (M8), yet it has a bigger display to light up. We will surely keep a close eye on its performance in our battery test. So, is HTC Desire Eye a capable mid-ranger, or is it the company's flagship in disguise? Read on to find out! As always, we will kick the review off with unboxing, followed by design and hardware inspection. The AT&T version of HTC Desire Eye we tested comes in a carrier branded box, which contains just the basics. The handset comes bundled with a charger, a USB cable, and the usual array of booklets. There is no bundled headset with the AT&T Desire Eye. The accessory could well be region specific. HTC Desire Eye also works with the company's rather brilliant Dot View case. The software behind the accessory has received several updates already, so the cover shows all notifications from the device. Its graphics can be customized too. HTC Desire Eye is unmistakably a member of the company's mid-range family. With a plastic body surrounded by a contrasting frame, the handset could be easily mistaken for the less capable HTC Desire 820 if it weren't for its 13MP front-facing camera. The abovementioned snapper rightfully gives the smartphone the Eye moniker in its name. The camera literally gives the impression of an eye that's constantly looking at you. HTC Desire Eye is available in two color schemes - white with red frame like the model we tested and a dark blue one with light blue frame. Both color options look good in person, though a slightly more serious black version would have also been appreciated. Overall, the design of the HTC Desire Eye can be described as decidedly casual. The smartphone is handsome in the flesh, though it certainly looks less serious than its hardware suggests. HTC has always enjoyed a reputation for making solid devices and the Desire Eye is no exception. The smartphone is solidly put together from high-quality plastic. The latter has the same finish as that of HTC One X - the company's 2012 flagship. The IPX7 certification is another assurance about the device's build. The handset can be submerged under 1m of water for up to 30 minutes. Like in the case of HTC Butterfly 2, the feat has been achieved quite neatly, without sealing off the ports of the device. Physical measures of HTC Desire Eye are 151.7 x 73.8 x 8.5mm, while its weight tips the scale at 154 grams. The device is slightly lighter and thinner than HTC One (M8), though far from being as elegant as the Moto X (2014) - the benchmark for compact measures in the segment. HTC Desire Eye is surprisingly easy to handle. Its matte plastic body is grippy so you are unlikely to drop it accidentally. The side power/lock key on the other hand, makes the device legitimately comfortable to use single-handedly. 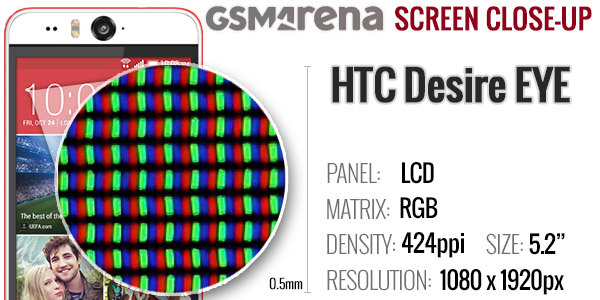 The HTC Desire Eye uses a 1080 x 1920px 5.2" IPS panel, which results in some excellent pixel density of 424ppi. The pixel arrangement is standard RGB, just as one would expect. The more detailed tests we performed on the HTC Desire Eye show the 5.2" panel as a solid performer. Contrast was impressive at 50% and 100% brightness, while the screen is amazingly bright. This lead to not so impressive black levels, but that was to be expected. The brightness also helped the smartphone in the outdoor visibility test, where it posted a very respectable score. We have seen phones do better, but the Desire Eye is easily good enough to be usable outdoors and that's what matters the most. The area above the display of HTC Desire Eye is quite busy. It is home of the 13MP front-facing camera, its two-tone flash, and a small microphone pinhole. The ambient light and proximity sensors are by the camera's side. One of the BoomSound stereo speakers is located under a tiny strip above the display too. The same goes for the earpiece. The second stereo speaker sits below the display. There's an HTC logo above it. On the left side of the device, you will find the microSD card slot and its nano-SIM counterpart. Both of them are tightly sealed. The volume rocker, the power/lock key, and the dedicated camera button are located on the right side of the device. Like we mentioned already, the side power/lock key helps the one-handed operation of the device a great deal. The 3.5mm audio jack sits uncovered on top. The same goes for the microUSB port on the bottom. Another microphone pinhole sits there as well. The main 13MP camera and its dual-LED flash are located at the top left corner of the device's back. A microphone pinhole and an HTC logo complete the setup. A small AT&T globe for the US carrier version is also sitting there. HTC Desire Eye is powered by a 2,400mAh battery. According to the official stats it should be enough for about a day's worth of 3G calls and 22 days on stand-by. Naturally, we've ran our battery test and the results are in. The Desire Eye is indeed capable of lasting 19 hours on a call. Its browser and video playback endurances are also commendable, and the standby performance is above average. The HTC Desire Eye posted 70 hour endurance rating, meaning you can use the smartphone for about three days and do an hour each of calling, web browsing, and watching videos each day. Make note, that our proprietary score also includes a standby battery draw test, which is not featured in our battery test scorecard but it is calculated in the total endurance rating. It's a surprising result since it matches what we got from the HTC One (M8) despite the smaller capacity battery and the bigger screen, which the Desire Eye touts. If you are interested how these results compare to other tested devices, check out our battery life test result table. HTC Desire Eye packs a solid set of connectivity features, mostly matching the One (M8). You still get quad-band GSM, 3G, and LTE support. The local wireless connectivity has Wi-Fi a/b/g/n/ac and DLNA support (both client and server, for images, videos and music) and stereo Bluetooth 4.0 with the higher-quality aptX codec. HTC has conveniently designed a special options screen, when you connect the Desire Eye to a PC. The long list of options includes Portable Wi-Fi hotspot, settings, USB and Bluetooth tethering (the _phone_ becomes a modem). NFC connectivity with Android Beam is available too. There's a microSD card slot too supporting up to 128GB of storage. USB On The Go and TV Out functionality are also available. Perhaps the only thing that's missing compared to the HTC One (M8) equipment is the IR port, which, with the right app, can be used to remotely control various home appliances. Depending on the individual preference however, that may not be such a huge loss. The HTC Desire Eye comes with Android 4.4.4 KitKat covered by Sense 6 UI. The built-in apps each have a different accent color which spills out onto the status bar, changing its color to create a uniform effect - similar to what we've seen with Apple's iOS 8. Sense 6 looks and feels just like on the HTC One (M8) and (E8. Here's a brief rundown of Sense 6 UI on the HTC Desire Eye. The lockscreen hasn't really changed much since Sense 5 - there's a clock with weather information and four app shortcuts. Swiping up takes you to the last app you used, while swiping to the left or to the right will take you to the homescreen or BlinkFeed, respectively. The HTC Desire Eye offers Motion Launch features like on the HTC One (M8). You can unlock the device with a swipe on its screen or a double tap when the latter is off. Once you unlock you're greeted by a practically identical homescreen as before and virtual on screen buttons. Having the buttons on-screen ensures better response time and less chance of operational deterioration but also means you're effectively giving up part of your screen estate in order to accommodate them there. The background behind the buttons is transparent and they obediently move out the way when you're watching a video or image so it's not that bad. But some apps still haven't been optimized to work with on-screen buttons and will stubbornly leave them there and shrink back the content to fit them, which isn't ideal. The leftmost homescreen pane of the Desire Eye is reserved for HTC BlinkFeed. It aggregates content from your social networks, as well as from various news sources. You can pick what topics you're interested in and BlinkFeed will automatically pull fresh content for you. You can also search for specific content. You can turn BlinkFeed off if you prefer or choose to not have it be the default homescreen. You get up to five homescreen panes to fill with shortcuts and widgets (the sixth is reserved for BlinkFeed). You can set any of the panes as default.. The notification area is business as usual - you get notifications in the right page and quick toggles in the left. You can access the quick toggles by a tap in the upper right corner or through a two finger swipe down from the status bar. The app drawer is vertically scrolled unlike stock. Aside from the usual alphabetical and chronological order of apps you can also sort them in a way you see fit. The grid of apps can either be a 3 x 4 or the more sensible 4 x 5. Getting to the recently-opened apps is done with the dedicated on-screen button. The interface shows a list of thumbnails for each app. You can swipe them away one by one as before or use the new close all option, thankfully. You can also get to the task manager from the recent apps screen - it shows you the currently active apps and RAM usage. Wallpapers, lockscreen style, ringtones, notification sounds and alarms can be customized via a dedicated menu. This time around, the lockscreen styles cannot be changed. The HTC Desire Eye also has a built-in restricted access Kids mode. It is an app that lets you set up a profile for each of your kids, with a photo and birthdate and pick which apps they can have access to. Everything runs smoothly on the HTC Desire Eye and Sense 6 offers fluid animations that don't get in the way of the processor. But that's expected given the hardware on board. The HTC Desire Eye is powered by the now widely used Snapdragon 801 chipset. It utilizes the Krait 400 CPU with a maximum clock rate of 2.3GHz. The CPU is joined by a snappy Adreno 330 GPU and 2GB of RAM. Our opening benchmark is GeekBench 3, which is a multi-thread CPU benchmark. The HTC Desire Eye did great and matched the best performers in our chart - the Galaxy Note 4 and the Galaxy S5. The new compound AnTuTu 5 benchmark however shows a rather underwhelming result - close to the rest of the recent Snapdragon 801 smartphones but still a step behind. The Basemark OS II gives an overall CPU score to the chipset but also breaks down the single and multi-core performance of smartphones. The HTC Desire Eye matched the overall and CPU performance of the other Snapdragon 801-powered smartphones. The HTC Desire Eye utilizes the same Adreno 330 GPU as the rest of the 2014 flagship gang. Unfortunately, the Desire Eye off-screen performance for some reason is behind the curve and its scores place it at the bottom of our charts. The actual on-screen performance turned out better, just a whisker below the 1080p Snapdragon 801 devices. You will notice that QHD smartphones such as the LG G3 and the Lenovo Vibe Z2 Pro occupy the bottom of the chart due to their high resolution screens being more taxing on the GPU. 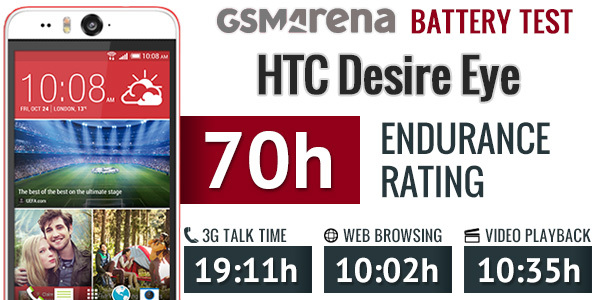 The GPU-intensive BaseMark X benchmark also puts the HTC Desire Eye behind the Snapdragon 801 competition. 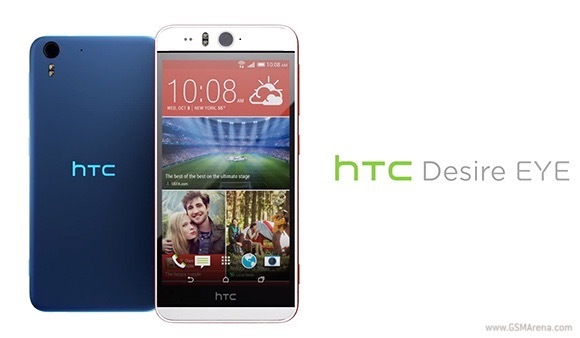 HTC Desire Eye is boasting a flagship Snapdragon 801 chipset that should give it enough raw power for everything. Unfortunately the GPU and web browsing scores turned out lower than expected, though not enough to give you troubles. The real-life performance is as snappy as it gets and we had no problems running whichever apps we tried. And if you don't like the performance of the default web browser, you can always opt for Chrome. In the People app, you get the dialer, contacts, groups (including favorite contacts), as well as a call log. You can reorder tabs and remove the ones that you don't need (Groups or Call history). The second tab holds the texts, emails and call history between you and the given contact. The next one displays a contact's social networking updates. The dialer on the HTC Desire Eye combines your keypad, recent call list and contact list in one application accessible via a single icon. You switch between the view modes with side-swipes. There's smart dialing and it works as well as expected. Once you start typing on the keyboard, contacts will be filtered by name or by phone number. You can use a QWERTY keyboard for searching as well. The smartphone packs a neat set of call-related tricks such as automatically silencing the ring of an incoming call just by putting the phone face down or raising the volume if the device senses it's in a pocket. As for call quality we can't complain with the HTC Desire Eye. The sound from the earpiece was clear and sufficiently loud and callers on the other end said we sound natural and clear. The BoomSound enhancement is constantly on when you are listening to something via the loudspeakers. The BoomSound speaker loudness isn't all that impressive. The HTC Desire Eye didn't perform very well when it came to mids or vocals. The only place where it was able to score good loudness is the high pitch ringing. We got an overall Average score when we measured its loudness with our digital loudness meter. Check out more about our tests and our loudness test in particular. HTC Desire Eye is capable of handling all sorts of messages - SMS, MMS, email. There's also Google Hangouts, which can connect you to Google contacts via either texts or video calls. SMS and MMS messages are displayed in threads - you see a list of all conversations, each one is listed with the contact's photo, name and the subject of the last message, as well as a part of the actual message. Tapping a conversation brings up the entire message history with that contact. Sense 6 intuitively lists all of your conversations in a single thread - whether you're texting the same person on a new number and then go back to the old one - it's all chronologically listed in a single thread. HTC Desire Eye comes with two email apps - the traditional Gmail app and the HTC Mail app. Gmail recently received a major update, which brought material design and support for non-Google email accounts. The HTC email app uses a navy blue top bar and merges it with the status bar for a nice design accent. As for typing, the Desire Eye's on-screen keyboard offers well-spaced keys, but the overlay doesn't include any gaps between them. During use we found that this is only a cosmetic feature and poses no discomfort. The 5" display diagonal offers enough space for comfortable typing. Trace keyboard is also available. You drag a finger over the desired keys and the phone predicts what you're trying to type. It works really well but language support is limited. HTC Zoe is a mini social network centered on sharing photos and videos. A landmark feature is the cool Highlights videos, which are created automatically for each album. HTC Sense 6 features Zoe as a standalone multimedia app, which requires you to sign in with your HTC, Google, or Facebook account the first time you open it. Captured photos and videos are automatically compiled into a Zoe video highlight reel. Creating a Zoe is easy. You simply choose from the available images and rearrange them in order you like. Themes and soundtracks are available in case you want to be extra creative. Once finished editing, you can easily share Zoes. Zoe also allows you to collaborate with friends on the same project (the creativity suite is available for iOS too). You can send requests and combine your media content into the same Zoe. The regular image gallery stacks photos together in albums, which can be organized by the date they were captured or the source they come from. Location-based sorting is also available. As usual, there is an array of available options at your disposal. You can edit, share, highlight, and delete images. You can also set them as backgrounds, assign them to contacts, add them to a specific album, or print them. Once you open an album, the first and biggest thumbnail is reserved for slideshows. Once you tap it you can customize if you want an effect added over the photos and what sort of music you would like to play. The gallery supports viewing your images in their full resolution. You can easily pinch-zoom to 1:1 magnification. The display on the HTC Desire Eye is more than adequate in both size and quality to allow for enjoyable image consumption. The video player on the HTC Desire Eye has a rather simple interface. There isn't a dedicated app - you just pick a video from the gallery. You get a Play/Pause button and a slider to scrub through the video, a button to capture images from the video, volume slider, and sharing options. All of these hide automatically after a few seconds. The HTC Desire Eye managed to play most of the files we threw at it and had issues only with FLV, MOV and a few MKV files (those with the AC-3 audio codec). The AC-3 audio codec also caused issues with no sound. Otherwise the Desire Eye was a solid performer. Subtitles were also not supported, with no options to enable them nor did they automatically playback if in the same folder as the video file. You can always go to the Google Play store and download a more capable video app for free. 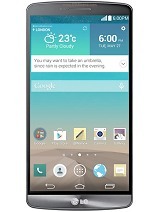 The HTC Sense 6 music player features a similar layout as the one in the previous version. The flattened interface design however makes the setup look fresh. Your music library is organized by Artist, Album, Songs, Playlists, Genres, Podcasts or Folders (we don't see this last option very often). The phone will also easily stream songs over DLNA. The music player can automatically look for and download Album art and artist photos (you can limit it to Wi-Fi connections only), and search for lyrics. There's no equalizer on board. You have the option to toggle BoomSound audio on or off when you have the headphones plugged in. Like we mentioned already, you cannot adjust this feature when playing through the speakers. The FM Radio is aboard with RDS support. It automatically saves available stations and has one of the simplest interfaces we've seen. There are play controls - play, stop, skip and a loudspeaker option. Slowly, but steadily, HTC made the perfect audio output a trademark for its smartphones. Today, we don't even consider it surprising when one of their smartphones posts chart-topping scores. The Desire Eye is yet another phone in a line of top-notch audio performers that can easily outclass any of their competitors. 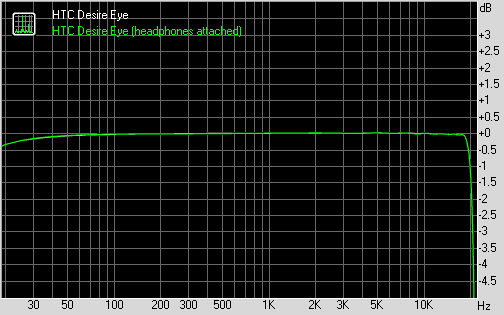 When connected to an active external amplifier, the Desire Eye managed excellent scores top to bottom with no weak points to its performance whatsoever. Loudness was off the charts too. Even better, the degradation when we plugged in a pair of headphones was so minor that we would have considered the scores great even if that was a no-headphones test. The well conrtained increase in stereo crosstalk means the smartphone would handle large powerful headphones with ease, while still delivering some of the cleanest outputs in business. Good job! The HTC Desire Eye introduces a dual setup for the rear and front camera where both snappers have similar guts. To begin with, both their sensors offer 13 MP resolution, auto-focus and a true-tone (dual) LED flash. The front camera however has f/2.2 aperture and a much wider field of view, perfect for group selfies. The rear camera's aperture is wider at f/2.0, but the field of view is tighter. The camera UI on the Desire Eye is identical to previous HTC devices and it's really easy to use and navigate. It offers HDR, Panorama, geo-tagging and image effects. The more advanced settings are hidden by default, but you can also control ISO, exposure compensation, white balance and a few other image adjustments. A long press on the screen will enable Auto Exposure and Auto Focus lock. You can set the volume rocker to act as a zoom lever or a shutter key. Image quality of the main camera on the back is equally good across the frame. The resolved detail is enough though it could have been better. Noise reduction smears the fine detail on a number of occasions. The processing is not as mature as some other cameraphones. The colors are accurate, so is the white balance. The HDR mode of the HTC Desire Eye camera snaps a couple of photos with different exposures and then combines them into a single photo. It tends to expose for the highlights and then brightens up the shadows in the scene. This in turn produces images with nice and even exposure, and without a nasty overly-contrasted, exaggerated look. HTC Desire Eye is capable of taking 360-degree panoramic shots, but those come with a quite low resolution. A 1080-degree pano sample spreads at 3300x665, which is quite disappointing. The quality and sticking process aren't something to write home about either. The front camera offers a dedicated Selfie mode, where you can enable options such the Smile shutter or you can apply different levels of digital skin enhancement. The image quality of the front 13MP snapper is different from what we saw on the samples taken with the rear 13MP shooter. The resolved detail is less, there is a considerable more noise, and the dynamic range is lower. The colors and white balance however are accurate, though slightly oversaturated. Here's the HTC Desire Eye included in our photo quality comparison tool. The tool is designed to allow you the ultimate pixel-peeping experience and the option to challenge the smartphone to any of the many other shooters we've tested. The HTC Desire Eye offers 1080p video recording in up to 60fps, though there's also a 30fps mode for FullHD videos, and 120fps mode at 720p. The front-facing camera can also record 1080p videos. The 1080p videos default at 30fps, and carry a bitrate of just under 20 Mbps. Framerate is indeed a constant 30fps throughout the video. Audio bitrate sits high at 192 Kbps and offers two channels (read: it's stereo). The quality of the videos is on par with that of the still images. They come out with comparable sharpness, the same high noise levels, contrast and saturation that we saw in the still images, and the colors are also accurate. The dynamic range is lower though. The 60fps mode is very similar to the 30fps, having the same 20 Mbps bitrate and dual channel audio at 192 Kbps. In this mode there's a slightly wider field of view, however, which means that you'll capture more in the frame, but it won't be as detailed. There's also a yellowish tint to the images. 60fps mode works just as advertised, however, in reality the videos have a constant frame rate of 50 frames per second. Nevertheless, the action in these videos is much smoother than on the standard 30fps ones, while file size is surprisingly not that much higher. The resolved detail however is noticeably less, and the dynamic range is poorer. You can download a 1080p@30fps sample, as well as a 1080p@60fps sample taken directly from the device. Finally, the 1080p videos at 30fps taken with the front snapper came out with the same bitrate as the one from the main camera, but the frame rate is lower, falling down to 26fps. The video quality is on par with the quality of the photos taken with the front camera - there is less detail, more noise and a wider field of view. You can also download the untouched 1080p@30fps video sample taken with the front camera of the HTC Desire Eye. In the video comparison tool you can face the HTC Desire Eye off against any of the other camcorders we've tested over the years. The HTC Desire Eye comes with a Sense-d version of the stock Android browser and Google Chrome out of box. The stock browser packs the usual features: Incognito tabs, Find in page and Desktop view. GIF animation can be enabled from the settings, but there is no Flash support. Besides the usual bookmarks, you can keep a Reading list of pages to read later and a Watch list of videos. Pages are saved on-device so they can be read offline, but videos are not. The Watch list feature works on sites like YouTube and Vimeo. It detects multiple videos per page (so you can add them all) and when you're ready, you can check them out without any distractions from the page they were on. Google Chrome is becoming the most popular mobile browser and should be fairly familiar. It has some advantages over its vanilla-flavored buddy, including switching between tabs with a wide swipe from either the left or right of the top bar. Chrome has Incognito tabs, too. Speaking of tabs, it can sync what you have open on other devices (desktop, tablets) with the phone. This feature also syncs your bookmarks and favorite sites and can remember passwords and login data. The Tasks app is HTCs way of letting you organize your time. It can handle multiple separate lists of tasks and syncs with your Google account. Each task can have a due date and a location associated with it. Map view lets you easily find nearby tasks, though we would have loved a "Navigate to" button here. Google Drive comes preinstalled. It combines all of your documents, spreadsheets, images and more in one easy to use data vault app. You can also access more than a single Google Drive if you have multiple profiles on your smartphone, which is neat. Users of HTC Desire Eye will get 100GB of free Google Drive storage for two years. There's no office editor out of the box. However, Google Docs, Sheets, and Slides are completely free, hugely capable, and easy to use. The apps integrate with Google Drive too, thus making work across OS platforms a breeze. The Alarm clock application can handle multiple alarms, each with its own start and repeat time. The stopwatch and timer are self-explanatory, as is the calculator. HTC Backup can do manual or scheduled backups of your apps, messages (texts and emails), contacts and accounts (mail and social). The data is sent either to Google Drive or Dropbox and you can limit the app to transfer over Wi-Fi only. Google Now integrates with your Google account and can access your daily routine, internet searches, email, etc. and give you information relevant to your interests and daily needs. It provides traffic information to your work or home, knows the scores of sports teams you follow and gives you the weather forecast for your location. It's great for at-a-glance info, but can handle voice Google searches as well. It also has a dedicated homescreen/lockscreen widget. HTC's Weather app can give you weather information for your location and others. It looks great and gives you an animated representation of the weather conditions as well as a multiple-day forecast. Weather information is sourced from AccuWeather. The HTC Guide app is an excellent app for beginners. It contains tips and help, troubleshooting info and a display of the vital phone stats the support call center might ask you about. The phone health option offers some self-help tools like running diagnostic on individual components (speakers, backlight, buttons). The app will also help you manage the storage with a handy option to clean unwanted files and trackers for call minutes, texts and data plan megabytes. Another great support tool is Android Device Manager. It's available for all Android devices linked to your Google account. It can help you find your misplaced HTC Desire Eye by ringing it and if it's not at the house, by finding it on the map. If it's stolen, you also have the option to lock the device and delete all data (so make sure you have HTC Backup set up to work automatically so you don't lose your data). You have to enable the remote locking initially via the preinstalled Google Settings app on your smartphone. And finally, Google's Play store hardly needs any description. It the biggest catalog of apps and also features movies, TV, music and even devices but those services are dependent on your country. HTC Desire Eye is the most capable smartphone the Taiwanese manufacturer has to offer. Only its Desire moniker, the plastic body, and the smaller marketing budget prevent the newcomer from taking the HTC One (M8) spot as the company's Android flagship smartphone in the second half of 2014. We believe that many will find the capable duo of 13MP cameras and the IPX7 rating that HTC Desire Eye has to offer are well worth it over the metal body of the M8. The argument is especially valid for those who are into selfies. The Taiwanese manufacturer has opted for a curious product strategy for the second half of 2014. Rather than launch another flagship device like it did in past years, HTC released a characterful mid-ranger with top-end specs and rather unique feature set. Such a combination should keep the manufacturer under the spotlight without stealing too much attention from the metal-clad M8 halo range. Both the front and the back camera of the HTC Desire Eye delivered stellar performance, which harks back to the days when the company was among the leaders in image quality. The Eye Experience suite by HTC on the other hand ensures that the capable imaging hardware is utilized well. Qualcomm Snapdragon 801 is not the latest and greatest the chipmaker has to offer, but it never left us wanting for more oomph. The chipset is powerful for every task out there and will surely remain relevant over a typical device usage cycle. The 5.2" 1080p display is a quality unit as expected from HTC. The BoomSound stereo speakers complement it perfectly and make the Desire Eye a great platform for gobbling up multimedia content. The plastic body of the handset surely doesn't look as premium as the metal attire of the HTC One (M8), but is solidly put together and, thanks to the IPX7 rating, easier to live with on a daily basis. The side power/lock key results in improved handling too. We also wish that the device's stereo speakers were as loud as those found in the HTC One (M8). However, the presence of IPX7 certification surely makes up for the lack of decibels. UHD video recording would have been a welcome addition as well, especially since we know that the hardware is up to the task. Hopefully HTC will resolve the lack of it with a future update. HTC Desire Eye is priced at $149.99 with two-year commitment to AT&T or $549.99 outright. As expected, both prices sit below those of the HTC One (M8). As always, we took a look to see what else you can pick up for the money. HTC One (M8), One (E8), and Butterfly 2 are the Desire Eye alternatives from the manufacturer's own stable. Each will offer similar hardware performance and price tag, with the exception of the E8, which is cheaper. The Butterfly 2 comes closest to the Eye spec for spec. None of the three devices however is even remotely as capable as the Desire Eye when it comes to selfies. LG G3 offers bona fide flagship hardware for the same money as the Desire Eye, headed by a gorgeous 5.5" QHD display. However, the Korean entry is not waterproof and it can't capture selfies like its rival, or play tunes on stereo speakers. 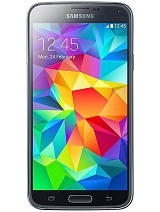 Samsung Galaxy S5 is also within the budget category that HTC Desire Eye occupies. The handset offers superior camera with UHD video, gorgeous display, and fingerprint sensor. However, the S5 lacks stereo speakers and a 13MP front-facing snapper. 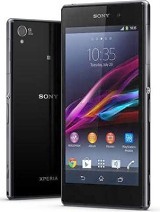 Sony Xperia Z2 is another formidable rival standing in the way of HTC Desire Eye. It trumps the newcomer on all instances, except selfie capabilities. Despite the flagship competitors in its way, HTC Desire Eye surely has its charms. The front-facing camera that gives the handset its name is undoubtedly its key selling point - if you like selfies, this surely is the phone for you. Thankfully, we can promise you that even in this case, the front-facing camera will not be the only thing you will like about the smartphone.